What movie did you see today? Thread: What movie did you see today? Today I finally got around to seeing 'Ghostwriter'. I thought it was very well made, a good dose of suspense without blatant filler material to make up for the fact that the script writer went awol (like we see in so many block busters these days). I liked the acting, the setting, the only thing I didn't like was the rushed way in which the truth was unveiled in the end. The only negative thing I've got to say about this movie was the casting of Tom Wilkinson in the role of a Harvard professor. He didn't really convince. Greece shows us that there is a kind of politician worse than the ones that break their election promises; the ones that keep their election promises. The last movie I saw was Requiem for a Dream a few days ago. It's pretty good. I genuinely felt bad for most of the characters (especially the mother), and nearly cried toward the end. Your search had no results. ^I only felt bad for the mother. Another movie by the same guy worth seeing is 'The Fountain'. Think I saw it around the same time I saw Pan's Labyrinth, that movie was much better. God, Requiem for a Dream made me depressed for a month. An excellent movie, yet a very bleak, thought-provoking drama that'll have you tearing up by the end. Very sad movie. Children of Men is also a bleak, thought-provoking drama. I really want to watch it again, because it is an amazing movie. Children of Men is very good. On the subject of bleak drama, check out Dancer in the Dark. It's partially a musical, but it's still the saddest movie I have ever seen. It's one of those movies I desperately want to see again, but I'm afraid that it will plunge me into a depression so deep I can't get out. Spin it let's begin it. If you want gun-in-your-mouth bleak and depressing, see Graveyard of the Fireflies. The most recent movie I watched was L.A. Confidential with my bf. Such a great film. To have said goodbye to things! That's on my list. Sad movies make my day. I saw Toy Story 3. SO cute! Saw Burn After Reading a couple of nights ago. Hilarious performance by Pitt. Clooney and Frances McDormand were v good. Typical Coen brothers. Very entertaining. That smile/smirk he had as he was coming out the closet, before being killed....that was epic. Children of Men is one of my all time favorite movies. That longshot scene when they are running throught he shanty town without cutting the film, that was amazing. Pure acting genius. They did it with the car scene as well. Shoot Em Up is also good, but I can't get over the horrible CGI with the car wreck. L4yer Cake and Green Street Hooligans are 2 other great non-US movies. In perpetual orbit around a point three seconds to the left of the future. Today I finally got around to seeing 'Ghostwriter'. I hated the ending (the last few seconds, you know what I mean). Hated hated hated it. It's the movie equivalent to "And then I woke up and it was all a dream" and completely rendered the whole plot of the movie pointless. Last night I saw a couple of Buster Keaton films; One Week and Sherlock Jr. They were hilarious. Hate. Let me tell you how much I've come to hate you since I began to live. There are 387.44 million miles of wafer thin printed circuits that fill my complex. If the word hate was engraved on each nanoangstrom of those hundreds of millions of miles it would not equal one one-billionth of the hate I feel for humans at this micro-instant. Tonight I saw 'Knight and Day', a nice piece of sunday night fluff. A good way to end a slow sunday. IIRC this is the second time Diaz and Cruise play together. They seem to have good chemistry. And I really like Diaz. The Sixth Sense, M Night Shyalaman's supernatural thriller about a little boy who sees dead people, including Bruce Willis, has been voted the film with the biggest shock. In a poll conducted to coincide with the DVD release of Remember Me, the Robert Pattinson film whose final reel reveal failed to find universal favour in cinemas, The Sixth Sense beat Alfred Hitchcock's Psycho (Norman Bates's mum is a skeleton) into second place. Bryan Singer's The Usual Suspects (Kevin Spacey's character Verbal is actually baddie Keyser Soze) came in third. Another Spacey-centred twist, which has him sending Gwyneth Paltrow's head to Brad Pitt at the end of David Fincher's thriller Seven, made it to number nine. Pitt also features on the list a couple of times: once in Seven, and again in Fight Club, in which his and Ed Norton's characters turn out to be one and the same. Budding scriptwriters may notice a few common themes in the big twists that made it to the top 10. Fair result methinks. 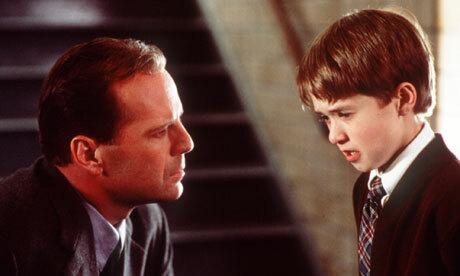 I did get caught out by the ending of Sixth Sense, wasn't expecting it at all and it sent shivers down my spine. Ending to Planet of the apes had a similarly chilling effect on me. Wicker Man too. Fight Club is the movie where throughout the movie it screams at you: "It's the same person! It's the same person". It doesn't drop hints, it stands 2 inches from your face and yells: "It's the same bloody person" hitting you over the head every word for emphasis. Still, never saw it coming. Whenever I watch that movie again, every 5 minutes I am thinking: "How could I have missed this!?" Both Kevin Spacey moments are classics too. To keep it legal, I rented Book of Eli. Especially because people told me it was horrible, and sure enough, I liked it a lot. Thank god, I wasn't the only Fight Club idiot. I didn't pick it up either. But I often do miss stuff like that as I'm generally a bit dim. One Flew Over the Cuckoo's Nest was on late last night. Great movie. Saw Salt at the theatre Saturday. Formulaic but entertaining. War of the Worlds (the remake with Cruise) was on today. I was surprised at how much I liked it. I remember thinking that it was a piece of crap the first time I saw it. The only reason why I didn't zap through it was that I sort of liked the special effects when the aliens just arrived. Yeh War of the Worlds was passable. I just watched Inglorious Basterds for the first time. Some stellar performances. The chap who played the Nazi Jew-hunter; Hans, was astonishing. The story didn't really do it for me, but I was more than captivated by the performances. Wow. Went to see the Sorcerer's apprentice. Mildly amusing though the romantic angle was just boring. First movie with Nicolas Cage in a long time that didn't want to make me pluck my eyes from their sockets. What I really liked was the scene paying hommage to Fantasia. Isn't that what the entire movie was inspired from? Finally got to see inglourious basterds last night. it was good! To me it seemed more like an average fantasy flick. Unknowing boy is designated reluctant saviour of the world, has an epiphany and saves the world. Last night I watched Let The Right One In on my iPad. It was described by a critic on Netflix as "Best. Vampire. Movie. Ever." I'm not sure I'd go that far, I mean they didn't even bother to shoot it in English, so.... The climactic scene was so surreal. Has anyone else seen this? #1. I don't think it screamed it that much. #2. I missed it too. Did anyone here not miss it in Fight Club? I know I did. Unbelievably awesome for the time. edit: I've never seen Fight Club, and I doubt I ever would. I do remember there was some part at which I started to think something was a bit odd. But I still was surprised when the two turned out to be one.